This project involved transforming the look of a semi-truck into a pop-up stage resembling a company trailer. 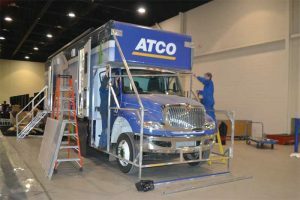 The illusion was achieved using an aluminum frame and individually printed panels incorporated into a full vinyl with laminate wrap on the truck and its chassis. A custom frame was welded to the front of the truck and printed graphics were applied to the aluminum composite. 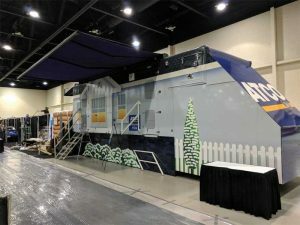 The wrap was designed to show a colourful image of a cottage, complete with windows and doors, and timely seasonal props.